Pratyusha had placed an order for a wedding "Lehenga" before the suicide! Home Balika Vadhu Bigg Boss 7 BOLLYWOOD Colors TV Jhalak Dikhla Ja Pratyusha Banerjee Rahul Raj Rahul Raj Singh Rakhi Sawant Saloni Sharma Pratyusha had placed an order for a wedding "Lehenga" before the suicide! Pratyusha Banerjee was an Indian television actress. She started her career with Balika Vadhu as Anandi which was very successful. She was popularly known as Anandi by her audience. Pratyusha Banerjee of Balika Vadhu fame committed suicide on 1st April. The actress’ death news has become a big news as it was very unexpected. The actress who rose to fame after her first role as Anandi in Balika Vadhu became an instant hit because of the innocence she brought to the character. She rose to fame and people appreciated her notable performance and lauded her for the same. 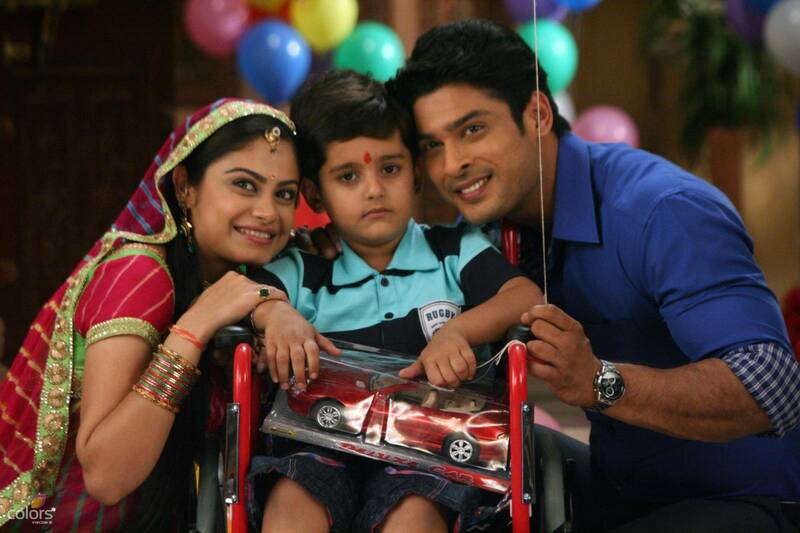 Post Balika Vadhu, she appeared in quite a few television serials including Hum Hai Na, Bigg Boss 7, etc. The diva also had a lot of friends in the industry. While several of them despised her boyfriend Rahul Raj Singh (who is suspected to have had a hand in this suicide), they nevertheless, were pretty tight with her. 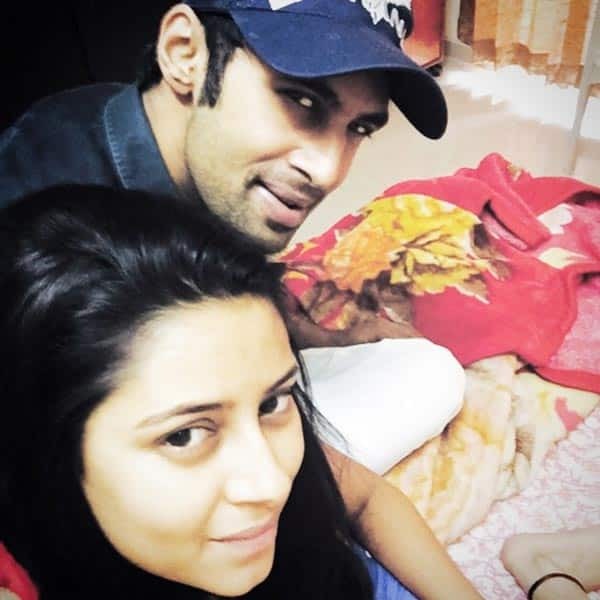 Pratyusha Banerjee was shocked to learn that her beau Rahul Raj Singh was allegedly engaged to Saloni Sharma and that proved to be the last straw! Pratyusha Banerjee shocked the entire television industry after taking her own last night (April 1) at her Goregaon flat. It is reported that her boyfriend dropped her off at the Kokilaben Dhiribhai Hospital in the city, took her phone and made an exit from the scene. While he is in touch with the police, stating his side of the story, Telegraph newspaper has some details on the strained relationship between Rahul and Pratyusha which may have pushed her to take this extreme step. She badly wanted to settle down with beau Rahul Raj Singh. What her father & flatmate said? 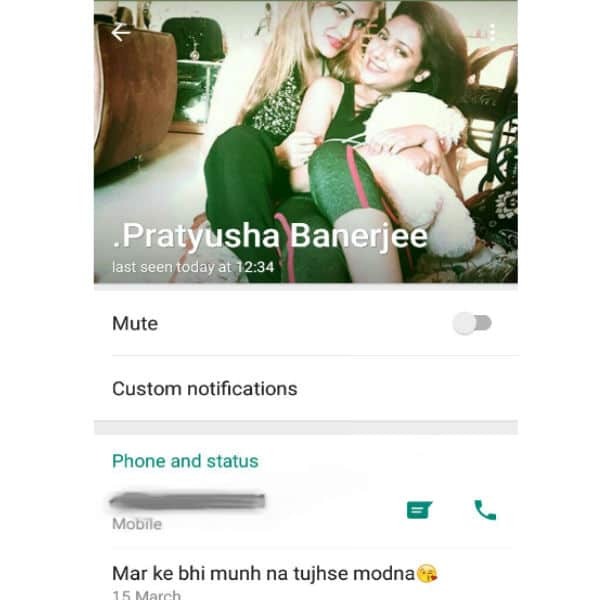 Did Pratyusha Banerjee’s last WhatsApp status indicate something? Pratyusha Banerjee had put up this status on March 15th. Check out what Pratyusha Banerjee’s friend Vivek Mishra has to say about her suicide and Rahul Raj Singh. Vivek Mishra says that Pratyusha Banerjee used to pay for Rahul Raj’s expenses. 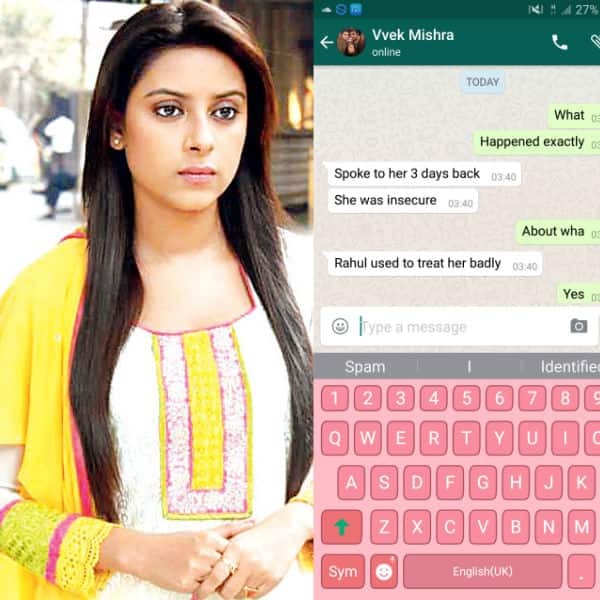 According to Vivek Mishra Pratyusha Banerjee’s boyfriend Rahul Raj use to check her cell phone. ‎Rahul Raj Singh‬'s alleged affair with ‪Saloni Sharma‬ resulted in death of Pratyusha? # A case of suicide due to personal woes. Reports claim that the actress was having trouble in her relationship with Rahul Raj Singh leading her to take such a drastic step. # Reports of Pratyusha having financial perils are also doing the rounds. The actress didn’t take up any project for the past four months resulting in her financial crisis. This may have pushed the actress to end her life. # Celebs from the TV fraternity claim that it is not a suicide but a murder. Actor Ajaz Khan openly stated that he doesn’t believe that it was a suicide as she was a strong person. He however, thinks that it is a cold blooded murder. Even another celeb from the industry thinks it’s a murder and not suicide. # Sources close to the actress also stated that her boyfriend Rahul Raj Singh got engaged to someone else triggering her to take such a drastic step. One of the biggest theories making the rounds is that Rahul got betrothed to someone else that left the actress heartbroken. # Possibility of men who posed as cops earlier this year to be behind this death. Another speculation behind Pratyusha’s death floating about is the involvement of the men who posed as cops who, according to her report, had tried to molest her. Theories suggest it could be a planned murder. # Career downfall is another theory that has been gaining limelight. A lot of speculation has been going on concentrating on her work front. These claims state that Pratyusha did not have any job leading to financial crisis. Gurmeet Choudhary and Debina Bonnerjee were the first ones to see the deceased actress’ body! Pratyusha had sindoor on her forehead? Actress Rakhi Sawant has suspected boyfriend Rahul’s role behind the death of Pratyusha. She said that she was shocked to see the dead body of Pratyusha at the hospital. 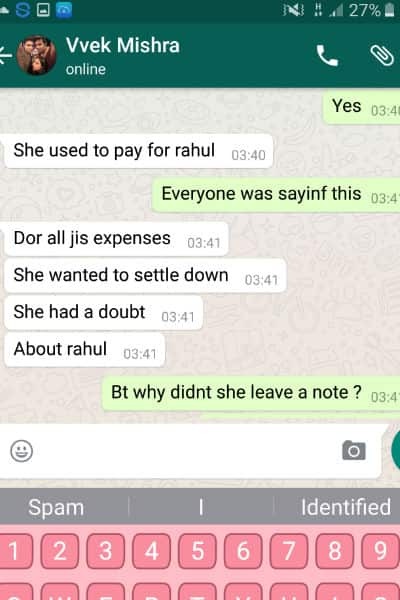 Rakhi has alleged that Rahul Raj was eating chips after admitting Pratyusha to the hospital and was shocked to learn about his disappearance from the hospital in such a mysterious manner. “It is distressing to know that her boyfriend has taken away her mobile. I am afraid he will delete all the data from it. He was seen having chips at such a critical moment, I don’t understand what is he up to,” she added. 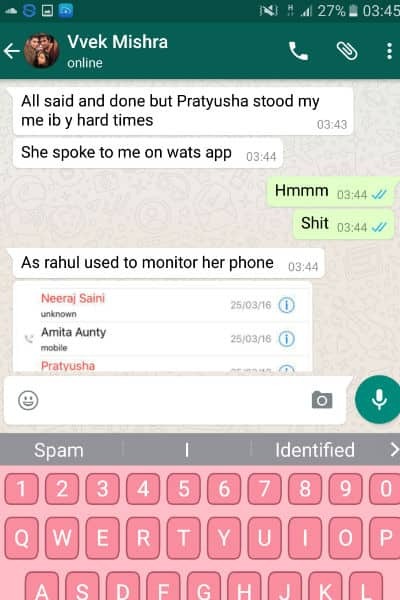 It seems Pratyusha was planning to get married soon to Rahul. She had placed an order for her wedding lehenga with designer Rohit Verma recently, a source told The Telegraph, Calcutta. “Knowing Rahul had got engaged to someone else seems to have been the last straw. She had a massive row with Rahul,” said a police source to the daily. It is very sad and disheartening, Our team's heartfelt condolences, thoughts and prayers are with Pratyusha and her family.